Basil's dream of attracting a classy clientele comes true when Lord Melbury arrives. There's nothing Basil won't do for his Lordship, but titles can be deceiving. Basil's plans for a surprise party go horribly wrong when Sybil thinks he's forgotten their 15th wedding anniversary nad leave. Basil is left to clear up the mess. 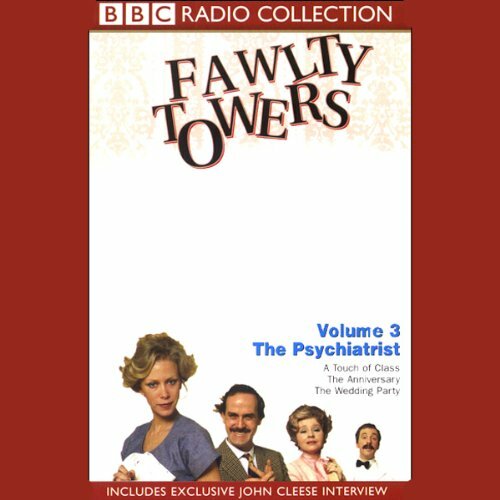 Sybil's interest is piqued by a young 'yobbo' staying at the hotel, while a visiting psychiatrist finds enough material for a conference when he encounters Basil Fawlty. Prudish Basil is outraged by the apparent promiscuity going on in the hotel, but it's the guests who end up shocked when they find Basil and Manuel in a compromising position. If You're Serious about Funny! Possibly the funniest series ever! John Cleese, Connie Booth, Prunella Scales et al. Cleese wrote the first 6 shows with Booth (his then wife......who, by the by, is American.) The series was so popular that BBC begged for 6 more episodes. Cleese and Booth (now divorced) got together and brought us 6 more gems of comic genius. The Major, Manuel ( who narrates the series in letters to his Mom ), Chef......they are all here! To my surprise I found that I enjoyed the audio version more than the televised show. If you are serious about funny, you will get the whole series post haste! I already have these. You lucky Audible Listeners! In addition to being brilliantly funny, Fawlty Towers is, at times, a very physical comedy with lots of visual gags (think of the German marching walk and the business with the moose head). They've neatly solved this problem by having the episodes narrated by Manuel, the Spanish waiter (Andrew Sachs). These voice-overs make it clear what's happening, but those who are very familiar with the show might find them unnecessary. There are also discussions with writer and performer John Cleese before each episode, which are well worth listening to if you're a fan and are after some extra insight and knowledge about the show and its creation, but also slightly give away some of the events in the upcoming show (but they don't ruin them at all). The episodes remain hysterically funny, but also painfully awkward, as they were on first viewing on the BBC. Brilliant work, and well worth a listen to revisit the good (and not so good) folks of Torquay. Comedy is defind in Fawlty Towers. The writing is superior and the casting of the characters was perfect. John Cleese is one comic perfect !! This is the only comedy that is very greatly enjoyed by either watching it or listening to it !! British comedy is the best and bightest when it uses it's dry and wildly funny wit, as found in Fawlty Towers. I know that you will come across people in your world that appear in Fawlty Towers. Have a super terrific time as you listen to Fawlty Towers ... Manuel, manuel, MANUEL !! !